We are pleased to be partnering with the Conference Board of Canada for the second annual Canadian Food Summit. As part of our partnership, we’re able to offer our contacts a promotional registration rate. For more information, please see below. There is a growing urgency for a national food strategy in Canada. A strategy that will safeguard and sustain the health and profitability of the producers, manufacturers, shippers, traders, distributors and retailers in Canada’s food system – all who are pivotal to ensuring the quality and healthiness and safety of the food supply to Canadians. The 2nd Canadian Food Summit 2013: From Challenges to Solutions will be the most interactive event we’ve ever delivered! It will engage and consult with delegates throughout the entire 2-day conference, to gather perspectives and maximum input on the draft Canadian Food Strategy, using the latest in hand-held voting technology combined with in-depth discussions and dialogue. The feedback will help refine the draft Canadian Food Strategy, set for release in November 2013. Building on the success of the 1st Summit, held in February 2012, this year’s Summit will once again be international in scope, attracting expert presenters and participants from across Canada and around the world. International speakers will share best practices to help overcome Canadian food challenges, and key lessons learned from launching and implementing their own national food strategies. Delegates will be invited to join one of the concurrent consultation sessions where you will be able to provide your feedback on the draft Canadian Food strategy action plans, through a highly interactive roundtable format and ‘instant voting’. Industry Prosperity – Increasing the output of Canada’s food industry to contribute to national economic growth and our global competitiveness. Healthy Food – Improving the health of food products and the diets of Canadians as obesity and chronic diseases become an increasing concern. Food Safety – Ensuring that food safety is maintained across the supply chain as globalization grows. Consumer Security – Improving food security to ensure that all Canadians have access to safe, affordable and nutritious food. The Summit is bringing together over 400 participants including key players in the food industry such as producers, processors, retailers, regulators, governments, associations, consumers, and independent experts. 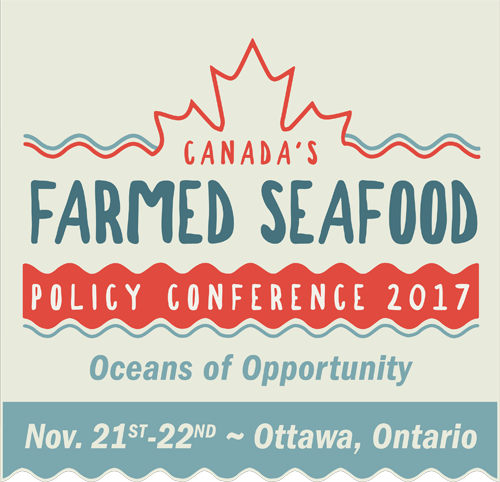 Contacts of the Canadian Aquaculture Industry Alliance can save on registration for this event! Non-registered delegates may please contact Tracie Jones at jones@conferenceboard.ca and quote code CAIA and pay a special lower rate to register. To find out more about the Summit including a list of featured topics, please visit the website. This week seafood professionals, seafood lovers, foodies, chefs and researchers will unite in the southern New Brunswick to experience Bay of Fundy seafood as they never have before. The 2012 Seafood Forum: Perspectives on Sustainability will run from June 5-8 and is a remarkable opportunity for seafood professionals and researchers to exchange information and discuss the evolving topic of sustainable seafood. The 2012 Seafood Festival will follow on June 8-10 which will welcome visitors from around the Maritimes and New England to kick off the summer tourism season with a full schedule tours of salmon farms, special seafood menus in local restaurants, seafood and wine pairings, music and the biggest lobster boil, clam bake, salmon BBQ and seafood feast that one can imagine. This region of New Brunswick is an ideal host for these annual celebrations. It boasts some of the world’s best North Atlantic lobster grounds and is the birthplace of Canada’s east coast commercial salmon farming industry. Bay of Fundy fishermen and fish farmers produce a diverse array of other seafood – including herring, shrimp, scallops, dulse, clams and mussels.